You forgot to set the beta for 1.12.1. On your site it shows an picture of the heat exchanger being able to produce almost 4,000 mb of steam /t, is that still an possibility in 1.10+ or was the machine purposely nerfed since then? cause i'm trying to get it that high but its only making like 600mb/t at maximum. Hello. I've been trying to use this mod, but the output blocks for IC2 power aren't appearing. What Minecraft version are you using? 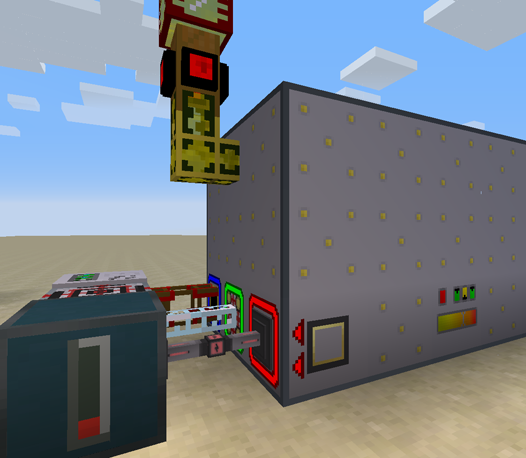 If you're using 1.7.10 you can output RF using Immersive Engineering wiring and connect it to IC2 machines and Electricity storages. If you're in 1.10.2 or above, look for the mod TATW on Curseforge. It is a mod that adds compatibility between EU and RF, which means you can use RF for EU. Hope that helps! In reply to IronMinecrafter111111: I'm using 1.11.2, it works, thanks! I would like to Thank you for your response to missing textures in JEI search as they are preventing me from using Optifine. I attempted to identify the issue to all the mod authors with missing textures in JEI and you are the only one that responded they would fix it. All others stated that it was Optifine's problem, or they were clearly w.i.p. and that is to be expected with modded Minecraft. Might be why many people refuse to play modded Minecraft. You should report the problems with optifine and missing textures to it's author. Broken textures happen, and if they make optifine crash - it should be fixed on that side. [00:56:26] [Client thread/ERROR]: Error while processing RsRecipeShaped(List(RMR, F1F, wRw),StackBlock(advgenerators,tesla_output,32767),1): Block name 'advgenerators:tesla_output' resolved to Air. This probably means that it isn't registered. So apparently lava created in Inductive Automation machines gives less heat in the heat exchanger? Never mind, I fixed it. I didn't have enough heat exchangers on the unit. How does this compare to Extreme Reactors? ExtremeReactors can produce more RF/t. but takes only a single kind of fuel, uranium. Advanced Generators takes liquid fuels from any number of other mods. For example EnderIO's rocket fuel and Forestry's ethanol. With 5(?) Manyullyn turbines, I was producing ~1800RF/t from memory. You can add more modules to increase it's internal buffer, swap out the tier 1 turbines when you have access to better alloys, etc. Setting up an Advanced Generator is arguably more interesting, but again it's something you only do once.